Char Koay Kak (Fried Rice Cake) is a popular Penang breakfast or supper street food usually served in small portions. Easy to prepare and super tasty. Heat 1 tablespoon vegetable oil in non-stick fry pan. 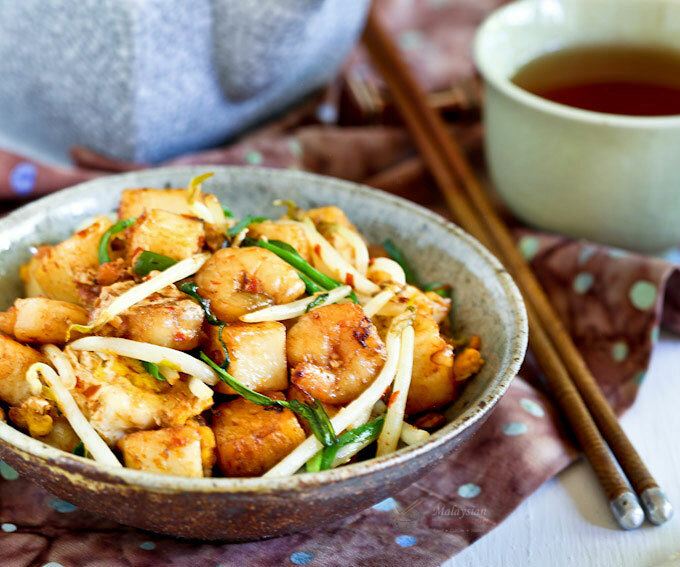 Pan fry cubed rice cakes until lightly brown in color, about 15 to 20 minutes. Remove and set aside. Heat a large wok on the stove. Add remaining 4 tablespoons of vegetable oil when wok is heated. Sauté garlic, chai poh (pickled radish), and chili paste for 30 seconds. Add shrimps and continue to stir fry for 1 minute. Then add pan fried rice cubes, sweet soy sauce, salt, and pepper. Stir to combine. Create a well in the center of the wok. Crack in the eggs. Stir and toss rice cubes over eggs to get them coated. Add Chinese chives and bean sprouts. Stir for another 30 seconds to 1 minute. Char Koay Kak is best stir fried in small batches. Ingredients may be halved to stir fry two servings at a time.